Savage has made the perfect boat an easy choice for fishing enthusiasts with their Runabout range of Bay Cruisers. 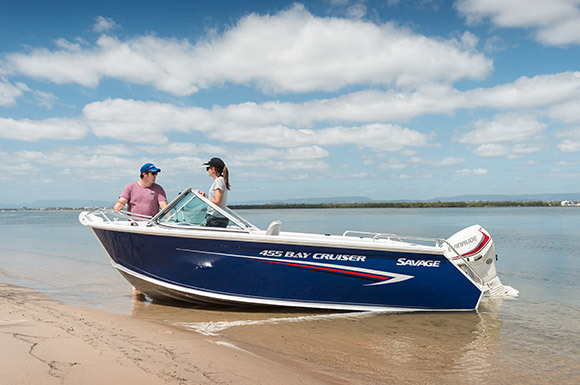 The Bay Cruiser models feature the popular sellers the 435 and 455, perfect for the professional fisherman or the first time boatie. The 455 Bay Cruiser model features Savage’s new Maximum Ride Hull which provides a smooth ride on the plane, efficient ‘hole shot’ performance and improved stability when at rest. National Account Manager Cameron Wood says the Bay Cruisers are the perfect boat for fishing and water adventures. “Savage prides itself on being the only Australian brand of aluminium boat to incorporate fibreglass decks to provide their boats with a stylish design. “An exciting new option is the transom door design which also allows for a full length rear lounge, so there is no compromise between functionality and usability. “All the Bay Cruisers have Savage’s unique rolled side decks for a stylish design and are packed with features for a great family time on the water,” he said. With the 435 Bay Cruiser reaching a maximum 40 horsepower rating, fishing enthusiasts will be able to get to their favourite spot on the water quickly and smoothly. The Runabout range is full of handy features for a great day out including a lean thru hatch for easy access, high side decks to keep your passengers safe, plenty of storage space with rod holders, glove box and side pockets and rear lounges for cruising comfort.